Our desire is to help empower the mother/family to have informed consent and educated prenatal care and their ideal birth experience. Every birth can be filled with joy. Studies show that home birth is as safe or safer for low risk mothers and babies than hospital birth. The state of Florida has some of the best laws and rules ensuring the safety of out-of-hospital birth in America. Studies also show the use of doulas can decrease the length of labor, the need for epidurals and/or C-Sections while increasing the mother’s satisfaction and mother/baby outcomes. Believing in the power of a woman’s body, our goal is to educate and provide safe health care during the prenatal period and to guide the natural birth process by providing safety, comfort and support. We also aid with breast-feeding, postpartum care and newborn care. Our job is not to make decisions for you, but to educate and support you to make the choices you want. You can hire a midwife and/or doula at any point in your pregnancy. Our purpose is to make the entire experience as comfortable as possible for you. We offer prenatal and birth services in Orlando and nearby communities. “I am passionate about working with a mother (and family) during one of the most miraculous events of their life. I believe that bringing a child into this world is a natural, beautiful moment. I also believe that parents should be well-informed about their choices during pregnancy, labor, birth and postpartum. My goal is to do all that I can to partner with the parents in bringing forth their ideal birth experience. I have birthed 4 children of my own and have different birth experiences with each one. Out of all the environments that I have witnessed, assisted and managed births, home birth is the one that struck a cord with me. The intimacy and comfort of home birth is something magical. 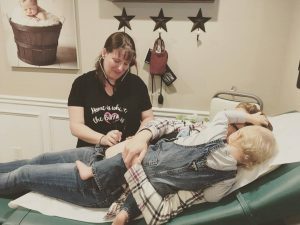 I practiced as a doula for 12 years before pursuing my dream of becoming a midwife. I attended midwifery school at the Commonsense Childbirth School of Midwifery in Winter Garden, FL. After 3 years of school and internship, I became licensed as a midwife in the state of Florida in July of 2018. “I believe it is an honor to assist families during the intimate process and celebration of bringing a new life into the world as a doula. I am happy to use my knowledge, skills, and experience in helping you make the best decision you see fit as you grow your family. When I am not working with new families I am at home with my 6 beautiful, loud and crazy children.